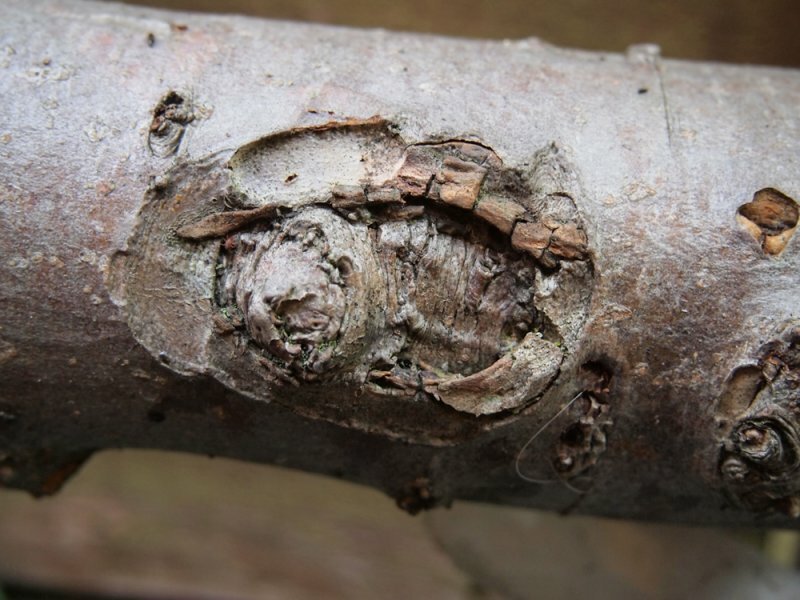 Cankers are formed as long, sunken areas develop on branches, often centred around a leaf scar, small side branch or bud. The bark at the centre of the area may die and break away. Young twigs may die back and entire branches can eventually be girdled by the disease and die back above it. Small cream pustules can appear on affected areas in spring and summer and small, round, bright red bodies in autumn and winter. Occasionally there may be a brief (but temporary) increase in cropping (particularly on apples) or the development of a papery bark condition. The fruits which remain on the tree can be infected by a brown rot, usually around the eye, and remain on the tree over winter. Affected stems and branches will eventually die back and infected fruit will rot and become inedible. The disease is easily spread by the conidia (produced by the cream pustules) and perithecia (produced by the red bodies) – two spore types which can be transported by wind or rain splashes to infect bark cracks, pruning cuts or leaf scars. Predominantly on edible and ornamental forms of apples (Malus) and pears (Pyrus). However, it can also affect Sorbus aucuparia, willow, beech, ash, poplars and hawthorns. It may also be a problem with cherry, maple and holly species. Use more resistant cultivars such as ‘Bramley’s Seedling’, ‘Lane’s Prince Albert’, ‘Laxton’s Superb’ and ‘Newton Wonder’. Although all apples are susceptible to some degree of cankering. Planting on wet or clayey sites, the application of too much nitrogen when feeding and under-planting the tree with grass can make the plant more susceptible to canker. If there is a history of cankering within the area, spraying new trees with the fungicide bordeaux mixture around the autumn leaf fall period can prove beneficial in preventing infection through leaf scars, although it is unlikely to be completely successful in preventing infection. Do not use trees which can be affected as windbreaks around apple orchards. Grey alder is a suitable alternative tree to use for this purpose. 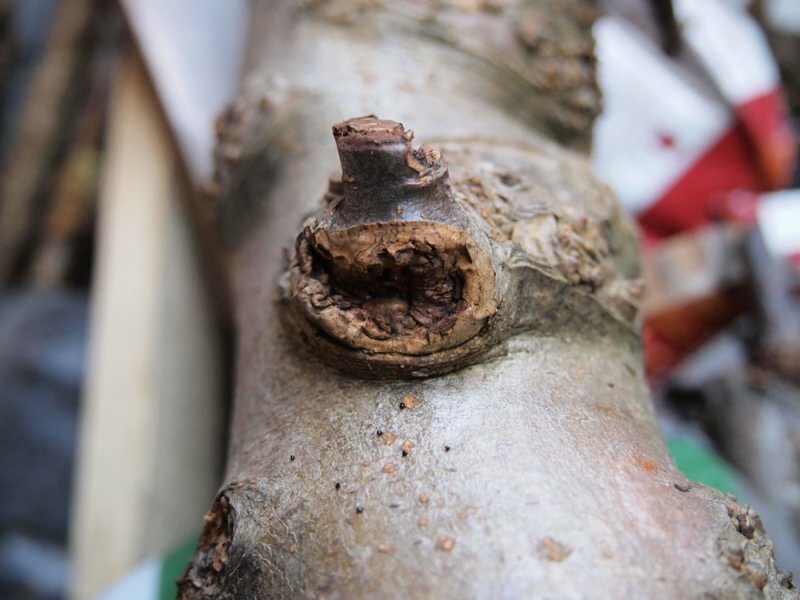 Prune out infected branches and pare out damaged material from large stems. Severely affected trees should be cut down entirely. All removed wood should be destroyed so that the infection does not spread (eg by burning). Many other diseases cause symptoms which are similar, including bleeding canker, apple flat limb, bark canker, brown rot, bitter rot and raspberry cane blight.